Last night, we hosted our Halloween food tour in Marble Arch – Tipple-or-Treat – celebrating the the most devilish desserts and cackling cocktails in the neighbourhood. We had a spooktacular and tasty evening joined by 24 of our business members, supporters and social media influencers. Our first haunt was Stuzzico, the long-established and well-loved, authentic Italian restaurant in Connaught Village. We kicked off the Halloween themed evening the only way we know how – with pumpkin and prosecco! 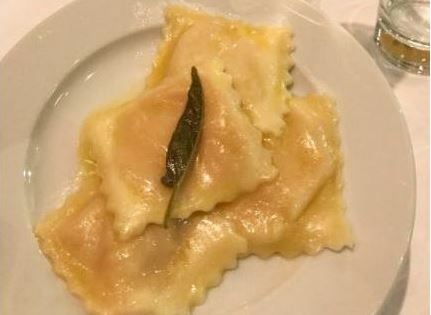 Stuzzico’s award-winning chefs treated us to the most delicate and festive pumpkin ravioli in a butter and sage sauce alongside a boo-tiful flute of prosecco. From Connaught Village, we made our way to a true Edgware Road institution – Maroush Gardens where we were sure not to miss the acclaimed and traditional bakalawa selection and fine wines! With so many options, it’s difficult to choose our favourite bakalawa. 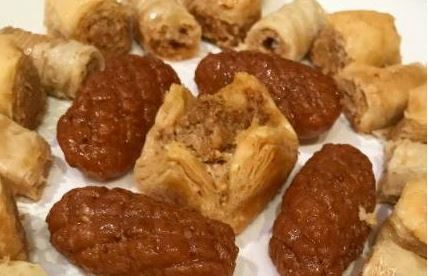 Thankfully, we didn’t need to as we were treated to all types from the most ubiquitous cevizli baklava (walnut baklava) and fistikli baklava (pistachio baklava) to more adventurous maamoul and maakaron. Next on the tour was Marble Arch’s newest restaurant, The Pickled Hen. 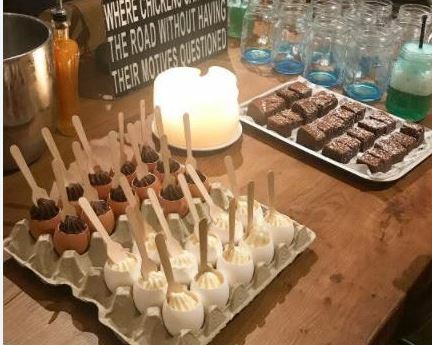 The new kids on the block did not disappoint with Pumpkin Martinis, bubbling Halloween Beer, Gooey Chocolate Brownies and their signature dessert, ‘Egg & Soldiers’ – a delicious white & dark chocolate mousse set in egg shells with brioche toast dippers. For those without a sweet tooth, there were mini sliders of The Pickled Hen Burger with beef pattie, pulled beef brisket, caramelised onion, Lancashire Bomb on brioche, bite size Fig & Caramalised Red Onion Tart, as well as Baked Camembert, Crispy Halloumi and Olive Tapenade tasters! Our penultimate stop, The Gate Marylebone treated us to like-as-a-ghost mini cappuccino cheesecakes dressed with a crumbled hazelnut base and mocha cream. It was so good many of the guests questioned it stating, “There’s no way this is vegan!”. The surprises kept coming as we sipped on the (haunted) house’s specialty cocktail – Le Boss Margarita. 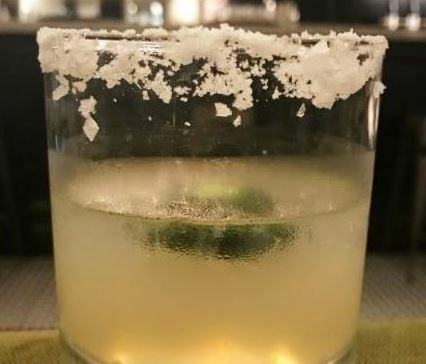 With jalapeño infused tequila, triple sec, lime and agave – we were fully in the ghoulish spirit! Our final destination, Roti Chai, had us wishing the night would never end! We were greeted with ice cold glasses of Kovalam Beach Kick – a lychee, guava, ginger ale and coconut cocktail with Roti Chai’s own chai-infused vodka. 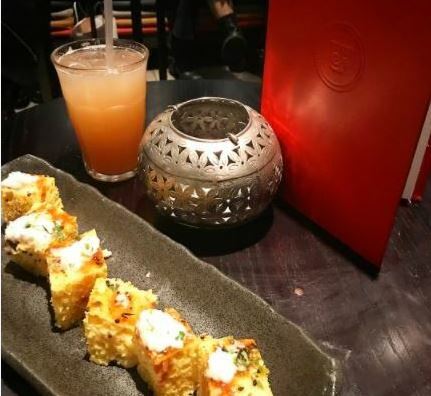 We were also treated (not tricked) with two Indian specialties Dhokla, delicious little cakes tempered with mustard seeds and topped with fresh coriander and grated coconut, and Dahi Puri, delicate and puffy puri shells stuffed filled with chickpeas and topped with chutney and yoghurt. It was a perfect note to end the night on and a wicked way to celebrate the Halloween and Autumnal season in the Marble Arch area’s dining scene. If you’re interested in attending our next food tour, message Taylore in the BID team at taylorehunt@marble-arch.london for more information.